Exertion Interfaces are interfaces that deliberately require intense physical effort. In short, they get your adrenaline pumping and make you sweat, just like any physical exercise or sport. They allow for Sports over a Distance, and Breakout for Two is such a game that you can play with a sports partner miles away. I tried to find out what makes sports so much more fun than computer games, and figured it is the physical exertion that connects people: You get to know a person much faster during a sports game than in a formal setting like a business environment, because you might see how this person reacts when winning, and how when loosing. You will also learn when you can swear, because once your opponent swears, you can swear, too. Breakout for Two is a cross between soccer (football), tennis, and the popular video game Breakout. 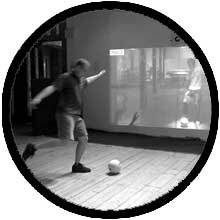 Participants in remote locations must throw or kick a real soccer ball at a local physical wall to break through a projection of virtual "blocks" that partially obscure a live video image of the other player. The effect is one of a virtual game "court" in which the competitors are separated by a glass wall through which they can interact. The trick is, that these blocks on each player's screen are synchronized - when one player breaks through a block, the same block disappears from the other player's screen. This is similar to tennis, where you always have to watch what the other player is doing, and differentiates this approach from a gym with a videoconference. The player breaking through the most blocks wins. The idea is that such a game might enhance the potential for social bonding, functioning as an "ice-breaker". This hypothesis was tested with 56 participants, who said they got to know each other better, became better friends, felt the other player was more talkative, and were happier with the transmitted audio and video quality in comparison to a control group playing an analogous game using a traditional keyboard interface. This work was presented at various international conferences and received international recognition, all papers, presentations, videos and posters available on http://exertioninterfaces.com.